HOME side Henley went down to a 4-2 defeat against Winchester in freezing conditions at Jubilee Park last Saturday. The game was in doubt as snow covered the ground but good work by the groundsmen in clearing the pitch ensured the match went ahead. The game started positively for Henley with Mortimer, Heaver, Walter and Hughes-Burne controlling the transfer of play nicely and linking well with the midfield trio of Gupta, Joyce and Ralph. The game was open with both teams looking to hit on the counter and several phases of play later Henley found themselves with a 1-0 lead, courtesy of a tap-in from Ed Foster. This was Foster’s fifth goal of the season. Winchester managed to grab a foothold in the game and Henley gifted the visiting side three goals before the break due to individual errors. Henley went in search of the much-needed goals in the second half. Despite Green, Taylor and Newbold linking up well at times, the visitors managed another breakaway goal leaving Bream no chance as a squared ball was tapped in at the far post. With 10 minutes remaining Winchester picked up two cards in quick succession and the hosts were able to capitalise with a well taken goal from Taylor. HENLEY 3rds’ hopes of securing back-to-back promotions continue after they ran out 5-4 winners at Leighton Buzzard on Saturday. Going into the game the visitors needed to win all three remaining fixtures to secure second position and keep the possibility of back-to-back promotions alive. 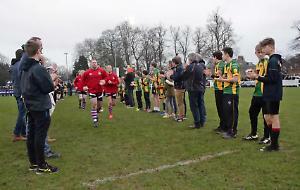 In a tense but thrilling match the difference between the sides was Mike Woolfrey, who put in an extraordinary man-of-the-match performance at centre forward. Sidelined through injury in recent weeks and a doubt for this game, the veteran pushed himself through the pain barrier and used all his experience and guile in an unfamiliar position to inspire victory by either scoring or setting up all five of Henley’s goals. In the bitter cold and driving snow of Bedfordshire, Henley initially struggled to gain possession against an assured Leighton Buzzard side who looked extremely dangerous in their attacking play, the visitors fortunate not to go a goal down in the opening minutes. With Jack Draycott marshalling the midfield, Henley regained some confidence by retaining possession and starting to break down the home side’s attacking moves. The opening goal was a gift that came against the run of play following a good move from Alex Price that found Woolfrey, whose shots found the goalkeeper’s pads several times before he calmly slotted a rebound. A second goal followed soon after with Woolfrey making a sharp pass to enable the unmarked Timothy Herbert to finish neatly. Though 2-0 down, Leighton Buzzard continued to press forward, snatching a goal back following a fast break. Leading 2-1 at the interval, Henley continued to pass fluidly, but Leighton Buzzard levelled the score following a defensive error which left goalkeeper Mike Cordrey stranded. Henley’s lead was restored following good skill from Herbert to win a penalty corner. Woolfrey calmly found the net with his second goal following a trademark one-two move with Ian Roberts. Leighton Buzzard once again snatched a goal back to level the scores at 3-3 and for some minutes both teams struggled to break the deadlock and gain the ascendancy. With just 10 minutes remaining an inspired move from the dangerous John-Joe Cottam led to another penalty corner, which Woolfrey slipped to Roberts who dispatched with a rasping strike. Soon after the fired-up Cottam helped to create the winning goal. Out of position and taking a free hit on the Henley area, Cottam ignored the captain’s instructions and saw the opportunity to drive forward powerfully, finding Woolfrey with an incisive pass. Woolfrey drew and held off the opposing defenders, and coolly played the ball into space for Herbert to run on to at pace. Herbert advanced into the Leighton Buzzard area and placed the ball past the advancing goalkeeper to take the score to 5-3. To the home side’s frustration, Henley played out the final minutes patiently before conceding a penalty corner at the final whistle. Leighton Buzzard finished neatly to take the score to 5-4.
HENLEY 4ths fought out a disappointing MBBO Division 8 West draw with bottom-of-the-table Wallingford at Jubilee Park, in freezing conditions on Saturday. The hosts started poorly and were unable to make any progress into attacking positions with too many attempts to penetrate the Wallingford 25 floundering on strong opposition centre backs as Henley time and again tried to force their way through the middle. Finally the ball began to get spread wider to the wings. One attack resulted in Simon Ward forcing his way into the D along the touchline which showed the route to goal. Building on this approach James Lane quickly followed suit, got to the touchline and squared for Ewan Watkins to slot home for the opening goal. Wallingford doubled their efforts and began to make forays into the Henley half, and put pressure on the home team. Keeper Neil Emmett was called upon to make some through ball clearances but was never really tested, until the award of a long corner which was quickly taken, the ball was brought into the D and a shot deflected off a Henley stick into the roof of the net leaving Emmett grasping at thin air. Henley pushed forward again and were rewarded with another attack down the right wing and another cross this time from Simon Taylor found Phil Biggs who beat the keeper to make it 2-1 at half-time. Henley started the second half well using the width to provide good outlets for the midfield but meaningful attempts on goal were not forthcoming, and again they reverted back to the earlier approach of trying to find a way through the more solid middle of the Wallingford defence with no success. Wallingford were now in ascendance building on some sloppy play from Henley and managed an equaliser when the Henley defence were caught napping and an early cross field ball found a Wallingford stoker unmarked to easily score. With the clock ticking down it was the visitors who looked the more likely to score, but with real goal scoring chances being at a premium both sides played out the game and settled for a point apiece.